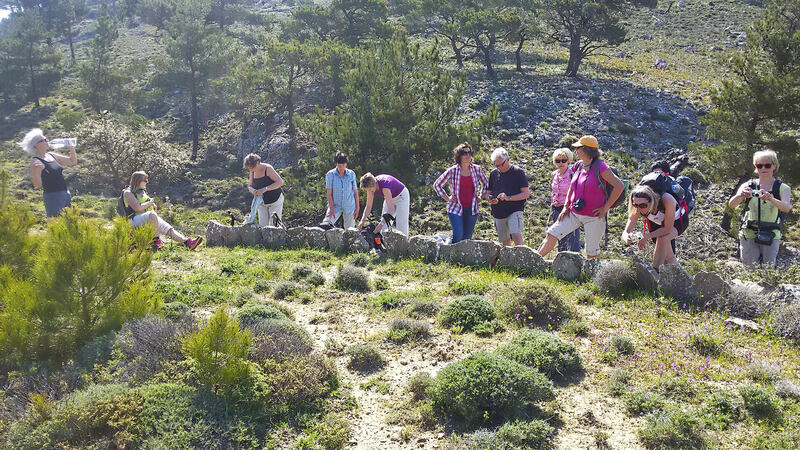 To walk with small groups in nature, connecting the locals and the visitors of this special island and discovering flora and wildlife. However, there is much more to see and to experience, like old traditions, culture, a rich history, and the daily life of course. This vision has become reality, and now I am able to offer all this to my guests. 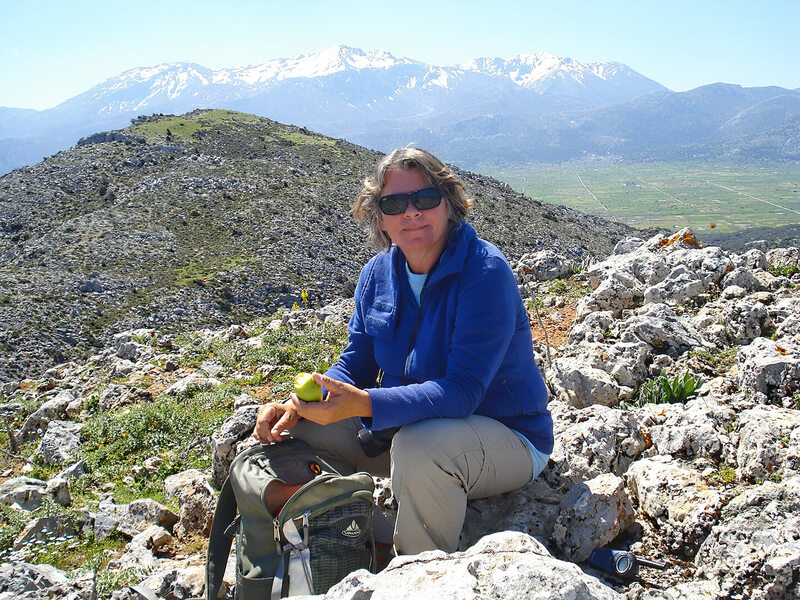 Walking together on tracks I discovered during years of research trough the various landscapes of east Crete. I would like to invite you to discover and meet Crete with its people and nature together in a unique and authentic way. In a choice of approx. twenty routes with different levels of difficulty, there is something for everyone. 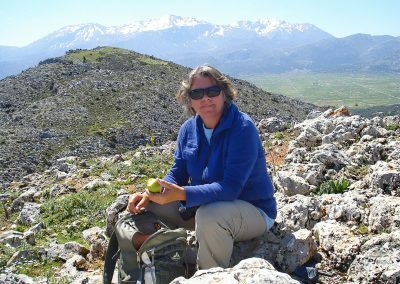 Angela is a licensed mountain walking guide and a member of the Austrian guide association Bergwanderführerverband Steiermark. She speaks German, Greek, Dutch and English fluently. An easy walk on dirt tracks in the surrounding of Kalami, an almost abandoned village, located between the hills in the region of Mirtos. 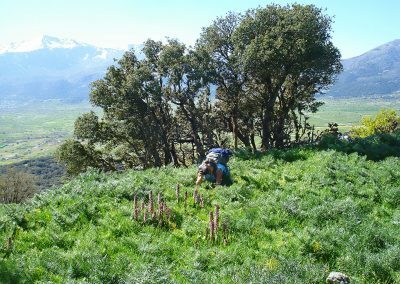 It is a good option for those who want to combine nature with the history of local life on Crete. 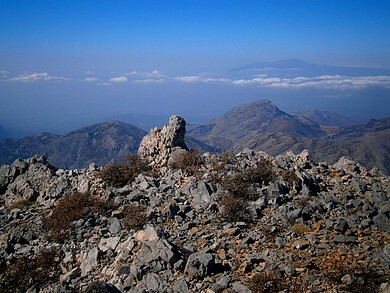 Mirtos is located at the south side of a large mountain range, the Dikti Mountains. 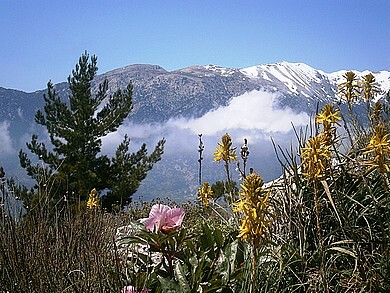 The highest point of these mountains is named by the locals Dikti or Spathi (sword). 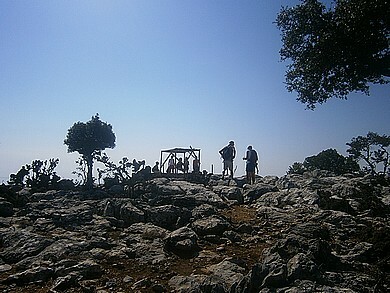 There are different options to reach the 2148 m high peak. 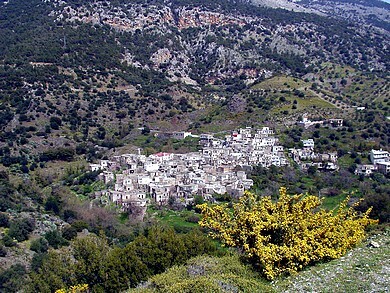 The nearest by Mirtos is the route from Selakano, a high located valley in the largest forest region of Eastern Crete. The first part of the walk goes along the E4 path (European long distance walking route E4) until a saddle and then further to the peak. It is a fantastic walk but sure also challenging with 8 to 9 hours walking time from Selakano and back. The path is partly very stony and rough, the yellow marking is sometimes not easy to find. From the saddle to the peak the marking gets worse and it has to be paid much attention to don’t get off the track. The rewards are great views to the Lassithi plateau, the Ida Mountains in de West, the Thripti Mountains in the East and of course to the sea at the North and the South side of the island. 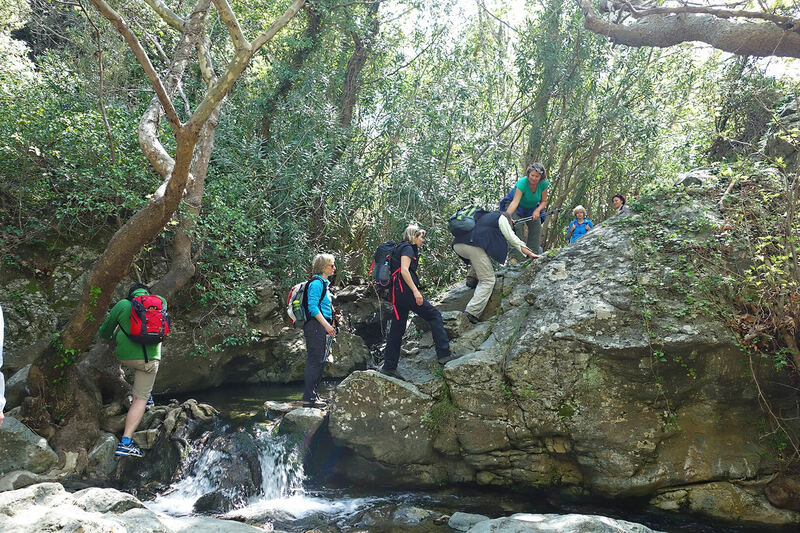 It is advisable to do this walk with a guide who knows well the path and the region. The best time to do such a mountain trip is in September and October. In this period the peak is free of snow and the weather conditions are still quiet stabile. Good condition, full health and good walking boots are required. 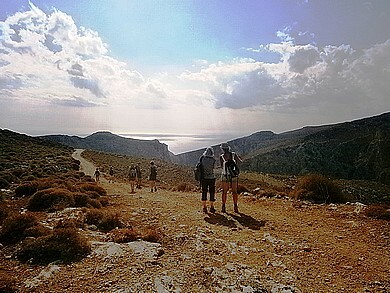 From the village Exo Mouliana at the north coast we start to walk on a dirt track above the gorge down to a resting area at the sea side, having beautiful views to the cliffs and the Cretan sea. Then we enter a totally different world, a jungle of trees and plants, small water basins and a 30 m high waterfall. 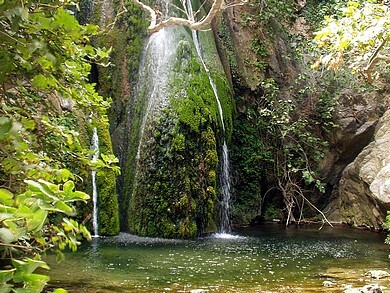 The Richti gorge is unique and shows an unknown face of Crete. This walk in the region of Anatoli, a mountain village above Mirtos, leads through a beautiful landscape with special rock formations and great views to both sides of the island. In spring we can find several rare species of wild orchids and other flowers. 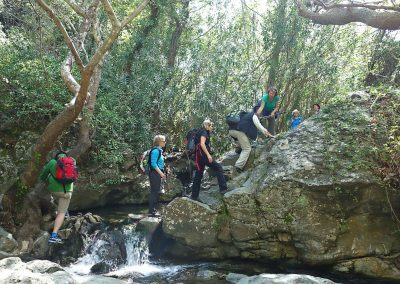 We pass the partly challenging trail through the gorge up to the village Pervolakia and return on an old stony path back to the starting point beside the monastery of Moni Kapsa on the south coast. 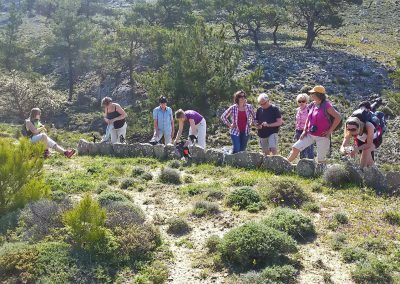 A beautiful round walk on dirt tracks from village to village along an old vine yard hill with fantastic views to the north coast and the Cretan sea. 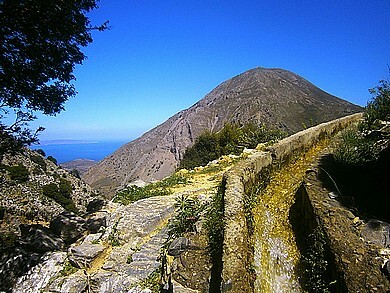 A steep donkey trail leads along the impressive Maizona gorge uphill to a Minoan excavation with great views to the Mirabello bay. 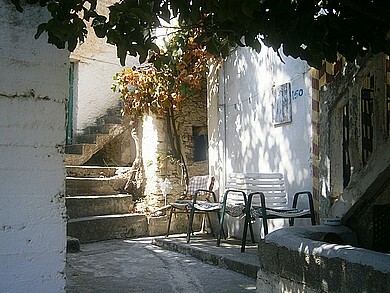 On an ancient path we return back to the starting point in the village Kavousi on the north coast. A circular walk in the forest region at the south side of the Dikti Mountain range; A steep path leads up to a view point with great views over the surrounding villages and the sea. We continue on dirt tracks through the pine tree forest, pass an archaeological site and return via an almost abandoned settlement back to the starting point. In the walking season in April, May, September and October it is possible to do a day walk. Touch the pictures to show and hide the description. You should have an average level of fitness and be in good health. The terrain is partly rough so it is important to have good comfortable walking boots to gain the maximum enjoyment of the walk. Average time of a walk is 3 to 5 hours, the routes are partly old cobbled paths or dirt tracks. The altitude is dependent on the walk and varies between 300 and 600 metres. There will be breaks during the trek for taking a rest, to observe plants and wildlife, and to enjoy the beautiful views.